Can the wholesale discount be calculated before coupons? I also use the plugin”WPEC bulk discount category” and I need to incorporate wholesale plugin after the “subtotal with no tax included” and before the coupon. Just wondering when you may be adding the minimum quantity option. I have products with price as zero. I want to hide these products from Site Visitor / Guest. I have set the “Product Visibility” to “Hide Product”, but still the product gets displayed for Site Visitor / Guest. Is it a bug in the plugin or am i doing something wrong? i want to be able to specify that the wholesale order should or a minimum order, can i do this with this plugin, rather then just price variation? for example can we just set an automatic number in the quantity?? I am using wholesale pricing with a Flexishop theme. Upon checkout the wholesale price is correct, but when looking at the products before adding them to the cart, the retail price is shown. Is this the way it suppose to be, or is there anyway to have the products show the correct wholesale price once logged in? I was unable to make the fix happen. I guess some of the lines of code were different so I was not exactly able to follow the readme. Think I may have messed something up because one of my plugins is not working correctly. Are you going to have the fix built in anytime soon? I had been out of town so a little delayed but thanks for you original quick response. Hi Anthony, feel free to get in touch as I’ll make this change for you. Remember to include login details (WP Admin and FTP). Before I update wpe can you confirm that they added the support for wholesale pricing as I can’t see it in their change log. Will this wholesale plug-in work with WP Flexishop or Express Store Premium ecommerce sites? IN general, Can I hide the prices from those who are not registered users? Here are the two themes. Hi, I am using the same theme (Flexishop), does it work? Would be great to hear before buying it! Thank you! Did you ever get an answer about whether or not we can “Hide” all pricing unless someone has been an approved/registered user? I may not need this plugin since we’re only going to sell wholesale – just need to be able to somehow hide all pricing and buy now buttons to users who haven’t been approved. Thank you very much. I finally managed to make it work. It was my own mistake. The plugin works really well! THANK YOU! Hi Michael, I have seen in a few comments people asking about your wholesale pricing plugin as it relates to taxes. Typically, when selling wholesale to customers, no taxes are charged because taxes are only collected when the item is resold at retail. However, when I use your plugin, my wholesale customers still see a tax charge in the checkout page. Is there a way in the current plugin to tell wp-ecommerce not to charge tax for wholesale customers? Also, is there a way to also eliminate shipping charges for specific wholesale customers? 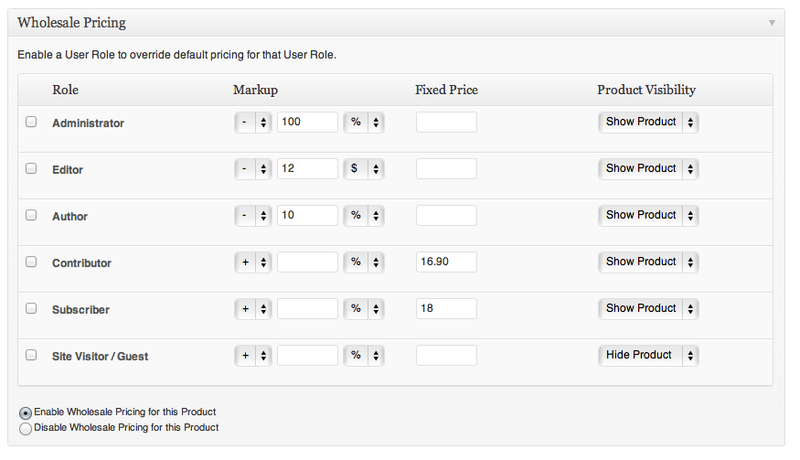 If not, these two features would be great on a future wholesale pricing plugin update. Please respond. Thanks. Hi Michael, I hope you can fix the sales tax issue soon. I am setting up a site with your wholesale plugin and I’m sure that sales tax will be a big issue for the client since they’re based in California. Therefore any wholesaler also based in California will be charged 9.5% tax when they shouldn’t be. Have you had a chance to take a look at excluding taxes during checkout? Hopefully the formatting won’t be messed up when I post this. Since this modifies a core function, it will have to be manually changed everytime there is an update. thanks for offering this Ed. I’ve been waiting for ideas on this very issue. I’ll implement it to see if it works out. Hopefully the formatting from your post was correct. Looks like I replied prematurely. The version of WPEC I’m running is 3.7.7. The file structure & file you referred to does not exist on that version. The only “tax” file I could find was tax_and_shipping.php located in the main WPEC directory and it doesn’t have code related to what you’ve posted. 🙁 Back to the drawing board. I figured that might be the case. Anyone know of which file in 3.7.7 I could apply this kind of fix to? Do what I did – look in the template file for checkout that calls the function for taxes, and keep following subsequent function calls until you find what you need. Your plugin works very well, but my client is concerned because there is no way to prevent a wholesaler from simply ordering a very small quantity or dollar amount. And since there is no easy way to check if an order is from a wholesaler, this could be problematic. Please tell me minimum purchases (both currency and quantity) is being worked on! Hi Michael, I think prior to successful checkout would be the better way, Thanks so much! Were you able to implement a minimum wholesale order? Also, if the client want to sell wholesale only in a login-required area (no retail), will this plugin do the trick? I just bought this great plugin. Is there a way to show discount according to user when logged in? On cart widget or product page? Hi Ivana, I’ve added this to the Ideas page as a feature to implement for Wholesale Pricing. This looks like a great plugin. Can you tell me if it has the ability to set individual product pricing for all levels or is it just a standard ‘x’ ammount added to the price as per user level? Hi Ashley, Wholesale Pricing allows you to assign a default pricing level – either $ or % markup/markdown – against each User Role which is then reflected throughout the store, within each individual Product you can override the default by assigning each Product it’s own pricing levels; again by $ or % markup/markdown. I know its early days, but I can’t wait for this update!! You wouldn’t happen to have a preliminary timeline or this? So far everything i have purchased from this site does not work with 3.8 as described. merely for the fact that myself and im sure others are all using product variations. when or how do we get this resolved? Hi Stevep, you should see a Plugin update available within your WordPress Administration if you’re using my Plugin Versions Monitor Plugin (http://www.visser.com.au/wp-ecommerce/plugins/plugin-version-monitor/). Ok, great thanks for the quick response. it is working now but only on the shopping cart level. 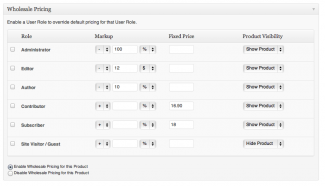 it doesn’t show wholesale pricing in grid-view or on the product pages. is this a supported feature? Is there an ETA on this yet. just did the update and made the changes to the changes to the core, though, still not having any luck. ok, i think i know my problem, the global setting seem to over ride the product variation (i think). would you be able to have a look at my db and code by any change..? Hi Andrew, I think I may have confused how to implement variation support. 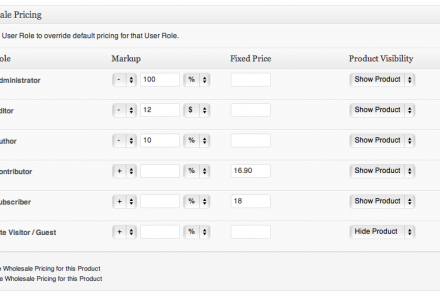 Right now Wholesale Pricing hides the per-Product properties and uses the pricing rules on the parent Product (e.g. Socks > Colour: Red, Socks would be the parent) in conjunction with the variation price (e.g. 10% discount on Red Sock that would usually be $4.95). Is this how you expected this behavior to work? Thank you for your quick updates on everything and for your awesome plugin. However, I’m really needing it to work with variations as every single product in this shopping cart has variations. When would this be possible. Hi Carolina, please download the latest 1.6.2 Plugin update, Product variation support has been cooked into this release. Just as you have been doing you set the pricing levels within the Product and those rules pass onto the Product variations. I’ll be working with the WP e-Commerce team to get the 3.8 changes included in the next Plugin update. Thank you! It seems its working fine but I think I’m doing something wrong. My client sells clothing. She has variations of colour, size and material on most products. The price is the same for the parent product (e.g. shirts). I will like to be able to set one level of discount for some users for the parent products. It seems that I have to do it for each variation and that will be a pain for me (e.g.shirt-blue-medium-cotton, shirt-blue-large-silk.etc). The discount appears fine at first. But when I choose my variations (e.g. red-large) the price goes back to the original. I’m not sure if this is clear. If you prefer I can send you screenshots to your email.